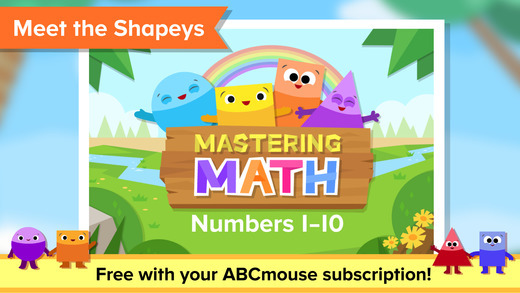 Age of Learning recently launched our new ABCmouse Mastering Math app for iOS and ABCmouse Mastering Math app for Android devices. The Mastering Math app offers a set of fun learning games that personalize to your child. This adaptive game-based app helps preschool and prekindergarten children build a strong understanding of the most fundamental math concepts: the numbers one to ten and the quantities for which they stand. Having that foundation is a key milestone of kindergarten readiness. With engaging characters and scenarios, individualized learning pathways, and continuous assessment built into every level of every game, Mastering Math helps children achieve proficiency through practice that incorporates repetition and variation—both of which are educational methods important to successful learning. Current ABCmouse members can use this app completely free just by logging in. If you are not yet a member, you can subscribe through this app to begin your family’s ABCmouse learning adventure. The Mastering Math app contains NO third-party advertising and DOES NOT share any personally identifiable information about you or your child with third parties.